HONG KONG, China (CNN) -- With the late evening sun casting a dramatic light across the 65th floor of an empty Hong Kong office block, everything was primed for a spectacular entrance from Hong Kong filmmaker John Woo. 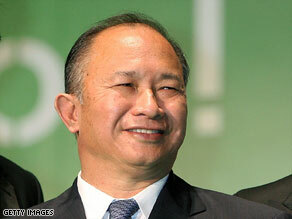 Director John Woo: Hardboiled on the outside, soft on the inside. With the scene set and cameras ready, the lift doors opened on cue. But instead of the director appearing, perhaps with a spectacular pyrotechnic backdrop or with a motif dove, out stepped one of the building's security guards wondering what a CNN film crew was doing filming an empty building. It turned out the 63-year old director was embroiled in another dramatic scene on the other side of town, commonly known as "Hong Kong Rush Hour." We were assured Jackie Chan wasn't involved in the hold up. By the time Woo did make it to the interview the sun was setting, but regardless of the scene or location, the unassuming 5-foot 5-inch tall director still casts an impressive shadow over international action cinema. From Hong Kong-based "Gun fu" flicks of the 1980s and '90s, to Hollywood blockbusters like "Mission Impossible II" Woo has made a reputation as a master of stylish gangster films and thrillers. His latest release, "Red Cliff: Part II", an epic-historical action film set in Three Kingdoms-era China, marked his return to China and a simpler method of making films. "Even though I enjoyed the opportunity to work in Hollywood, I never got used to their system. I didn't like much of the studio people. Well, there are too much politics and so much going on, and a lot of them have nothing to do with the movie. It's all about power, it's all about egos," Woo told CNN. Tom Cruise, John Travolta and Nicolas Cage are just a few of the A-list egos he has had to deal with in front of the camera. However directing actors, even a demanding Tom Cruise, is a pleasure not a problem for the self-effacing Woo, who admits his directing style is controlled and quite reserved. "Sometimes he [Cruise] gave me so many suggestions about the camera (and) about the scene. And then I knew he just wanted to be good. So then I just walked up to him, 'Tom just believe me, I will make you look great.' And then he had so much confidence [in me] and then he kept quiet and let me do my work. I did make him look good," he said with a chuckle. "Nicholas Cage is such a nice man. When working with him, I just feel like I am talking to Tony Leung. When I worked with John Travolta, it just made me feel like I am working with Chow Yun-fat. I think we have the same kind of emotion, the same kind of passion about life, about movies." Chow Yun-fat, a superstar in his own right across Asia, dropped out of Woo's "Red Cliff" just days before shooting began. However, it appears that no matter who he works with or where, Woo's passion for film-making and movies will never diminish, and he admits he still thinks of Chow Yun-fat as a good friend. At one point during the interview -- speaking about choosing the right guns as props for his 1987 film, "A Better Tomorrow" -- Woo reveals his almost child-like glee in putting together his shots and scenes. Woo's own childhood was spent in Shek Kip Mei, at that time one of the more insalubrious parts of the city, and cinemas and theatres provided both escapism and a physical escape from the violence and "hell" of life on the streets. "I had to fight to survive. Whenever I got beat up, I got upset, I also ran into the theater to watch a movie. But I have a very strong character, I never surrender, I (am) never afraid, no matter how big they are, how cruel they are, they never beat me down. "I didn't have money. I just sneaked in or watched the movie from the peephole. I have found my heaven in musicals. When I watch a musical, it makes me believe life is still beautiful. There are still a lot of beautiful people in the world. So I like the costumes, I love the song, I love all those smiles, I love those dance. In theater I found my heaven," he said. A religious man, Christian symbolism often appears in his films; he almost devoted his life to the church as a priest, but was dissuaded by the minister college. "They encouraged me to go for art. They didn't believe I could be a good minister. They just said, 'John you are so artistic, you just go for your art, don't come back.' I am grateful they knew me better," he said. It wasn't quite divine intervention, but no doubt millions of fans of his explosive cinematic style will be just as grateful he was persuaded to pick the directors chair over the pulpit.